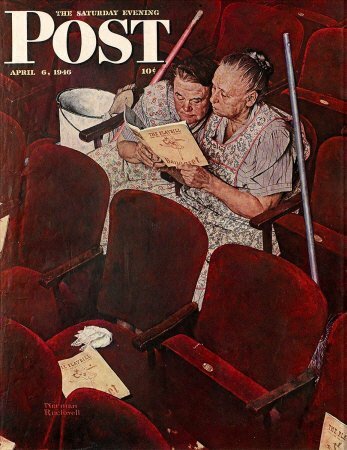 Charwomen In Theatre, a Norman Rockwell painting, appeared on the cover of The Saturday Evening Post published April 6, 1946. This is another favorite of Rockwell collectors, a classic enduring image of the world Rockwell painted. An alternate title for this painting is just Charwomen. This painting was Rockwell's 238th overall out of 322 total paintings that were published on the cover of the Saturday Evening Post. Rockwell's career with the Post spanned 47 years, from his first cover illustration, Boy With Baby Carriage in 1916 to his last, Portrait of John F. Kennedy, in 1963. This was also the second cover for The Post in 1946. In 1946, there were seven Norman Rockwell Saturday Evening Post covers published. The original oil on canvas painting, 42.5 x 33 inches or 108 x 84 cm, is part of a private collection. on page 166 of Norman Rockwell, A Definitive Catalogue by Laurie Norton Moffatt. One study also appears in the Norman Rockwell Catalogue on pages 166 and 167. One charcoal on paper study also appeared in the Smithsonian's American Art Museum in 2010. It was part of Telling Stories: Norman Rockwell fron the Collections of George Lucas and Steven Spielberg . This classic Norman Rockwell image is yet another study in hume psychology. This painting is recognized, like most of Rockwell's work, to be his own creation from start to finish. We do not know his inspiration for this composition, yet I beleive he simply noticed a discarded playbill on a chair when leaving a theatre or movie house and his fertile imagination took over from there. For starters, a charwoman is a woman hired to do cleaning or similar work, usually in a large building. The theatre is surely large enough for these women to be called charwomen. Both are older ladies and both are probably long-time employees of the theatre. People in the 1940's did not generally bounce from job to job. In 1946, with the influx of troops returning home, these ladies were probably glad to have a job to do. Charwomen In Theatre was only one of 322 Norman Rockwell Saturday Evening Post covers; Here is the list of Norman Rockwell Saturday Evening Post cover illustrations. I cannot make out the name of the production on the playbill or the name or location of the theatre. I see three copies of the playbill left on surrounding chairs, so the majority of patrons kept their playbill and took it home. Whether the patrons kept it as a keepsake of a night of wonderful memories or disposed of it in their own trash to spare its cleanup is not known or inferred. I found a cute video of a recreation of the events leading up to this scene on Youtube. I have included it for your enjoyment. Pause the video at the final scene and see if they got it right. Do You Have A Great Story, Opinion Or Contribution About Charwomen in Theatre?